A trio from Dresden, Germany opened the day with their combined routine. The highest score in the Women’s Groups for a combined routine belonged to the Belarussian group. Second yesterday, today scored 28.930, but didn’t manage to beat Russia’s overall score of 86.990 and 0.47 behind enter the final from the second position. The defending champions from Russia performed a vibrant routine to It’s raining men and made a mistake in one of their balances but even being a penalized with -0.6, their insane difficulty of 3.010 kept them in the lead. The Belgian group, 4th after yesterday’s qualifier, managed to move up to the 3rd position. They scored 27.440 and received amazing support from the home crowd. The Netherlands put up a good fight. Lisanne, Charell and Suzanne, first of the Dutch teams to perform today, yesterday finished 8th and today, despite a clean routine didn’t manage to outscore Mariska, Pleunie and Fem who we will see in the finals. 3rd after the first day Israel didn’t manage to stabilize the balance element and fell. The trio was given a penalty of 1.900 and today scored only 24.860; however, their qualifying spot is secured as they’re currently in the 6th place and we will see them in the finals with a new-life. 7th is the group from Portugal and in the 8th place there is the trio from Ukraine who despite a penalty of 0.9 for their balance routine and 0.3 for the mistake in today’s routine still managed to qualify for the finals. The group from the UK, for whom the unlucky dynamic routine where they scored just over 23.000 points decided about their spot in the final however after their energetic routine today they are now the first reserve for the finals. Trio of triple A – Anna, Alina, Annalena from Germany, who finished 5th overall in the World Games scored 26.160 and are the second reserve for the finals. Today we’ve also seen one withdrawal – the Women’s Group from Poland withdrew due to an injury – we wish you a quick recovery! There were some substantial changes around the lead of the competition. The defending champions managed to retrieve the lead, lost after the first two qualifying routines. Especially after their dynamic elements a loud AWW! was heard here in Lotto Arena. Nikolay Suprunov and Igor Mishev scored 29.240 and qualified for the finals from the first place. Germany’s Tim Sebastian and Michail Kraft, 1st after the first day of qualifiers and World Games winners, engaged the public with very entertaining choreography, however their score today was 28.170 which was not enough to maintain the lead. Compared to the Russian or Korean teams they’ve got lower difficulty (1.670) but they make it up with higher artistry and clean execution. They’ll enter the finals from the 2nd qualifying position. Our 3rd qualifier is the pair from Democratic People’s Republic of Korea. 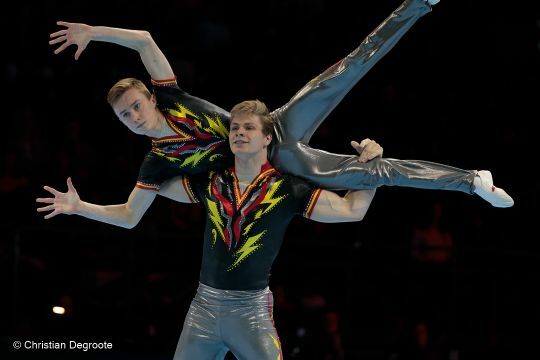 One again they demonstrated a routine with a massive difficulty value 2.820 – 1.150 higher than the German pair and 0.480 higher than the Russians, however lower artistry and execution marks put them in the 3rd position. 0.45 behind the Korean Pair is the team from China. They scored 28.600 with overall score of 84.130. 4th in Putian and in the World Games they will definitely do their best to get on the podium tomorrow. Belgian boys promised they will rock you and they did. Superb score of 29.220, which is only 0.02 less than the Russian score and it’s the second highest score for a combined routine. Their less fortunate first routine took a toll on the overall score - 82.620. The boys qualified for the finals from the 8th position, where they will get a new life. Will they manage to threaten the current leaders? The second session started with the Mixed Pair and Women’s Pair competition. Both opened by the partnerships who were leading after their first routine. In the Mixed Pair event we’ve seen another brilliant routine from Marina Chernova and Georgii Pataraia. The Women’s competition was opened by Mika Lefkovits and Roni Surzon. They had a small slip in the first dynamic element, however they saved it and got back on track. In comparison to their balance difficulty value over 2.000 their tempo routine got relatively low difficulty of 0.98 and the girls scored 27.730 and are still in the lead, however their advantage to 2nd Ukraine decreased and it is now 0.055. The Ukrainian pair performed another sensational routine, got great response from the audience and 28.050 which was the second highest score in the Women’s Pair category. In the 3rd place there’s currently the Korean Pair. The girls managed to maintain very steady, good level of performance throughout both routines and once again they had the highest difficulty value across all Women’s Pairs (1.980). In the 4th place are the defending World Champions who are climbing their way up after the initial misfortunes in their balance routine. The highest tempo routine score belongs to them (29.290) and they are currently 0.005 behind the Korean pair in the 4th place, that they’ll be definitely intending to leave tomorrow. In the 5th place there’s the American Pair – Aubrey Rosilier and Emily Davis, followed by Russia’s second pair Elena & Ksenia. 7th is Portugal that opened their tempo routine with strong dynamic element and impressed with steady landings. 8th are Nicole and Djenti from Netherlands and in the 9th place the team from China, whose unfortunate balance routine affected their overall score. Will they manage to score enough in their combined routine tomorrow, to get a shot at the finals? Tomorrow we’ll see all Women’s Pairs again in their combined routines and 6 of them will qualify for the finals in the afternoon. Who will it be? We just have to wait and see! Defending World Champions and World Games Champions opened the second qualifier. Even with a time penalty 0.3 they still achieved the highest score in their category and are still in the lead with amazing 60.610 total score. Their advantage over the second place is over 3.275. There are one step closer to making history tomorrow, if they manage to perform as marvelously in their combined routine tomorrow and later in the finals. The two Belarusian teams are still going head to head. After the second round of the qualifiers the standings reversed and now it is Konstantin and Hanna who are winning by the nose over Artur and Volha, World Games silver medallists. The difference now is even smaller – 0.16 so tomorrow we will witness an intense competition with both teams trying to qualify for the finals. Azerbaijan is still going strong! Today Ruhidil Gurbanli & Abdulla Al-Mashaykhi had a deduction of 0.5 and finished the 2nd day of qualifications in the 4th place they are still a worthy opponent, not to be overlooked! The second pair from Azerbaijan Nurjan Jabbarli & Aghasif Rahimov is currently in the 9th position. In Putian they took the silver medal in 12-18 Mixed Pairs competition leaving Ruhidil & Abdulla out of the finals. Will the roles change this time? We’ll know the answer tomorrow! Belgium’s Marte and Bram moved one place up from 7th to the 6th and they are now in between the Dutch teams. The balance skills are definitely their strength and today’s routine with 2.130 difficulty value, even after a deduction of 0.3 still scored 27.680. China also had a deduction of 0.3 however they also maintained a steady level of performance and are now in the 8th place. Tomorrow we will see the Mixed Pairs in their combined routine in the morning and in the final competition in the afternoon. 8 partnerships will perform their routine in the finals. We wish the best of luck to everyone for their final qualifying competition tomorrow! The Men’s Group competition yet again was the most spectacular event of the day. Today the groups performed their dynamic routines, which are even more breathtaking than the astonishing balances we’ve seen yesterday! There was a lot of people we’ve seen flying under the high ceiling of the Lotto Arena! We’ve also seen some surprising turns of events! The event was kick-started by the young Chinese group, who got the crowd moving to their compelling routine to the sounds of Bella Ciao. It was indeed a fantastic performance and they are currently in the lead, as the routine did not go as planned for the Defending World Champions. They didn’t manage to fully execute their first dynamic combination and with 1.000 penalty finally scored 25.840 so they are currently in the 4th position. Tomorrow both teams will perform the combined routine which will decided which team will qualify to the finals. Again fantastic Israel is now in the second place. With a difficulty of 1.900 (much lower compared to 3.150 to the Chinese group) they again put up a great show and scored 29.050. The Portuguese group once again proved they’ve got the moves! First time senior in the World Championships, the group danced their way up to the 3rd place. The first of the Russian teams is currently in the 5th place, followed by the German group in the 6th. German team from Dresden, Saxony presented a charismatic routine to Hit the road Jack. They had a very energetic interaction with the public, who loved their not only their dynamic skills, but also the great dance moves and rewarded their efforts with vigorous ovation! What got the audience screaming on the top of their lungs was the last performance of the qualifying competition today – the Belgian group! Once again Jonas Anthoon, Hannes Garre, Bram Geusens , Noam Raj Patel stole their hearts with energizing choreography. They are currently in the 8th place, behind Ukraine with 53.960. To get a chance to perform in the final tomorrow they would have to outscore both Ukraine and Germany. The last in the rankings is the second Russian group, who although they scored a great score of 28.130 for their dynamic routine, their unlucky balance routine badly affected their overall score. With one more qualifying routine to go, anything can change tomorrow!